As many of our avid readers will know (there are definitely loads of you – it’s not just me shouting into a narcissistic void), we have recently completed two of New Zealand’s most famous Great Walks. 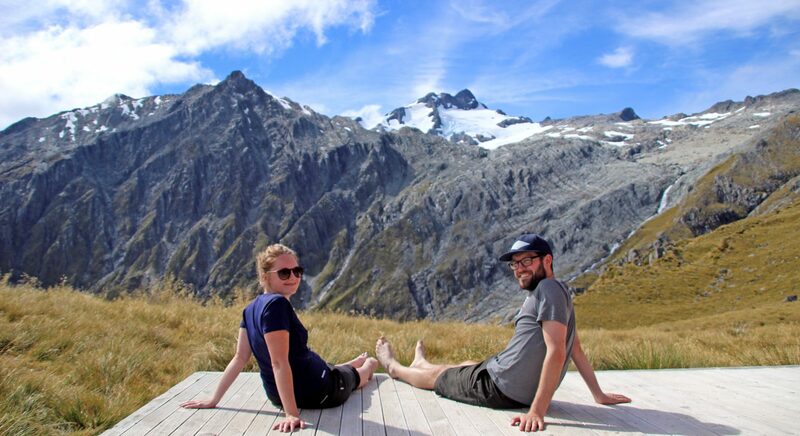 These were multi-day hikes in the utterly stunning Fiordland area. Firstly along the Routeburn Track, then the Milford Track. After trekking more than 80km over the course of the two walks, our legs were aching the beauty of Fiordland had swept us off our feet once more. Routeburn was rainy but our spirits were not dampened, despite seeing nothing but grey cloud at the walk’s famous viewpoint – the Harris Saddle. The clouds and rain couldn’t hide all the views, and while it was wet, it’s wasn’t as bad as the forecasts and the rangers predicted. Staying in communal huts each night, we met some great people from all over the world including Germany, Netherlands, Canada and America. Between sharing tales of travelling New Zealand, competing in quizzes run by the Department of Conservation wardens and gathering round the log fires there was plenty to distract us from the less than excellent weather. We were glad we were walking it at that time though as snow was forecast down to 600m the day after we finished. Although given how overly pessimistic the forecasts had been, we were a little dubious about it. Sure enough to snow came, and it caused havoc. The Routeburn and nearby Kepler tracks were closed. People had to be helicoptered off the track. Milford was also closed, and while the snow had made the mountains looks great, we began to seriously worry about whether we’d be able to do the Milford. After a couple of days rest in Te Anau, we set off for the longer Milford Track. Billed as the most beautiful walk in the world, it had a reputation to live up to. With Fiordland being one of the wettest places on earth – average annual rainfall of nine meters and 255 days of rain a year – we were surprised and cautiously optimistic to see a forecast for four consecutive days of sunshine, something that’s almost unheard of in the area. These tracks are one way, multi day hikes, so we had to leave our van in the car park and get it moved to the end. For both Routeburn and Milford we used Trackhoppers, who were excellent. It’s run by a local guy called Mike and his business partner. They’ve each done a vehicle move along the Routeburn almost 100 times, driving the 500km road route from Glenorchy to The Divide and then running the 30km back along the Routeburn track in one day. There’s always somebody who has to do it a harder way.